GARDAÍ WERE CALLED to the scene this evening, after a crowd gathered on Dublin’s O’Connell Street where two men were engaged in a fight. In footage of the incident seen by TheJournal.ie a number of people have gathered outside the area close to the busy corner of O’Connell Street and Abbey Street. Two men can be seen attempting to punch one another with many people gathered around and taking photos or videos of the incident. Gardaí arrived at the scene and can be seen detaining at least one of the men. A spokesperson confirmed to TheJournal.ie that officers attended the scene on O’Connell Street at 7pm this evening. “One male was arrested,” gardaí said. 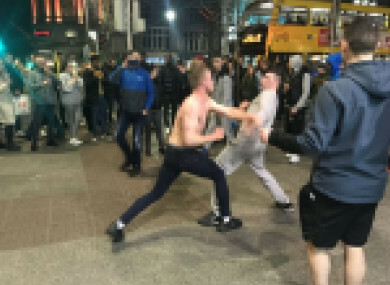 Email “One arrested after large crowd gathers around two men fighting on Dublin's O'Connell Street”. Feedback on “One arrested after large crowd gathers around two men fighting on Dublin's O'Connell Street”.